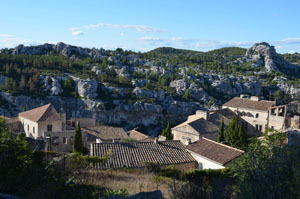 Today we explore Arles France and its Roman ruins plus a drive to Les Baux fortress. But first our B&B, Mas Guiraud includes breakfast. The usual French stuff (croissant, butter and bread, jam) plus hard boiled eggs, ham and cheese. I’m allergic to wheat so we had called ahead letting them know and they generously provided for me. I was very grateful. Spent the first part of the day in Arles. 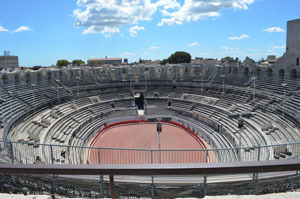 The must see in Arles France is Les Arènes, the famous Roman arena where 20,000 people could watch gladiators fight wild animals. It was the largest Roman building in Gaul. 2,000 years old it is considered the largest and best-preserved Roman monument in Provence. It is still in use today for bull fights. Quite impressive. Next we visited the Théâtre Antique (classical theater). Built by the Romans in the first century BC this theatre once seated 10,000 people. The only original remains are two columns, the rest has been rebuilt and is still used for theatre events. It was fun to sit on a seat and look towards the stage area and imagine how it must have been. This is not a must see but it was included in the ticket price for the Arena and is a few blocks away. The video intro is interesting. The cathedral is a must see but it hadn't open by 2:30. Enjoying a long lunch I guess. The facade is very intricate but that's all we got. 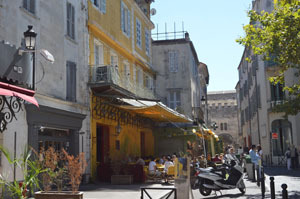 On to La Place du Forum (Forum Square), a lively town square with many cafes. 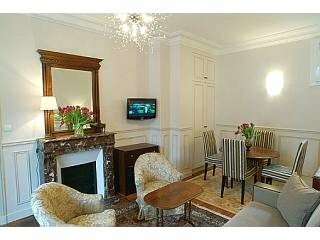 This is where van Gogh painted Café du Soir. One of the cafés made itself look like the café in the painting. Afterward we explored side streets of the old town. Drove home and plunked into bed.